Found in 1860 by Henry C. F. Koch (1831-1900), Koch and Co. were dry goods merchants who relocated their department store to this building on 125th St. in 1892. At that time the street was residential in nature, and H. C. F. Koch & Co. were pioneers in leading the changes that converted 125th St. into a shopping street. Henry Koch, the founder, was born in Germany, left home at the age of 20 (1851) to try his luck in the gold fields in Australia, then came to New York in 1858. According to a passport application filed in 1880, Henry Koch was born 29 April 1831 in Hannover, Germany. A later passport (1890) specifies Soltan, Germany, as his place of birth. This also says he arrived in New York 31 May 1858 and that he became a naturalized citizen 31 Dec. 1873. In 1890 Henry Koch was traveling in the company of his wife, Anna C. Koch, and their two children, Erduin V. D. H. Koch and William T. Koch. The original Koch & Co. was established in 1860 by Koch and his father-in-law, John Heath, at the corner of Carmine and Bleecker St. In 1875 the store moved to 319 Sixth Ave. on the corner of 20th St. An article in the New York Times, 11 Oct. 1881, p. 8, described this store as follows, "The large store of H. C. F. Koch & Son, corner of Sixth-avenue and Twentieth-street, was thronged yesterday with a crowd of visitors, attracted, apparently, by the announcement of a special sale during the present week of recently received importations. The display of novelties in moire antiques, rhadames, brocade satius, watered silks, plushes, and velvets was extensive and elegant. An entirely new line of French and English dress fabrics, new designs in shoodas, imperials, all-wool satin merveilleux, and armures d'or and d'argent were shown in endless variety, and in all shades and colors. The display of made-up dresses was much admired. Among the costumes attracting the most attention was a reception dress of shell-pink brocaded silk, cut à la Pompadour, with pointed waist and cardinal satin merveilleux trimmings. ... Elegant patterns in cloaks and walking jackets were also presented, black and white beaver, satin merveilleux, and satin de Lyon, with plush trimmings, being favored as materials. ... There was a full and complete line of shawls displayed, the prices ranging from $10 to $250. In the children's department many novelties were observed in street and school suits, a specialty being made of hand-knit worsted goods. ... The upholstery department is well stocked, and contains many handsome designs in curtains, lambrequins, and Smyrna rugs. Everything is displayed on one floor, necessitating no elevator or climbing of stairs." On Henry Koch's death, at Saratoga, NY, on Wednesday, 5 Sept. 1900, the following appeared in the New York Times, 8 Sept. 1900, p. 7, "Funeral services for Henry C. F. Koch, the Harlem merchant, were held yesterday afternoon at the Koch home, No. 224 Lenox Avenue. The Rev. C. B. Young, pastor of the Church of the Puritans, Fifth Avenue and One Hundred and Thirtieth Street, officiated. A quartet from the Liederkranz Society sang several hymns, all favorites of Mr. Koch, and by him selected long ago for the occasion. During the morning the 600 employes of the Koch dry goods store called at the house and paid their respects. There were many floral tributes from the merchant's business associates, club-fellows, employes, and others. Delegations attended the funeral from the Harlem Club, the Harlem Board of Commerce, the Liederkranz, the Empire City Savings Bank, the Harlem Bank, and the Hamilton Bank. The interment was in the family plot in Greenwood." On the elder Koch's death, management of Koch & Co. was taken over by his sons, Erduin von der Horst Koch (1872-1928) and William Theodore Koch (1874-1932). On the death of Erduin V. D. H. Koch the following appeared in the New York Times, 4 Dec. 1928, p. 27, "Erduin von der Horst Koch, president of H. C. Koch & Co., which firm operates a department store at 132 West 125th Street, one of the largest and oldest stores in Harlem, died suddenly yesterday in his home, 6 East Ninety-second Street, at the age of 56 years. Surviving him are a widow, Mrs. Jean Livingston Koch, and two daughters, Jean von der Horst Koch and Muriel Koch; his mother, Mrs. H. C. F. Koch, and a brother, William T. Koch. Mr. Koch entered the business of his father, the late H. C. F. Koch, forty years ago, after his graduation from a public school. The store had been established by his father sixty-nine years ago. The son became president upon his father's death. ... Mr. Koch was keenly interested in horses. Coaching was his favorite pastime in the days before the automobile caused the horses to disappear from the streets. ..."
In 1930 Koch & Co. was sold to A. Schaap & Sons. The closing of Koch & Co. was described in this article from the New York Times, 22 Aug. 1930, p. 9, "Memories of other days, when 125th Street was the promenade of many of New York's fashionables, passed in poignant review before William T. Koch yesterday as he stood in the store which for seventy years has borne the family name, and watched the passing crowds and listened to the incessant clatter of traffic. As if it were yesterday, he recalled the Harlem of forty years ago, a quiet and proud community of fine new apartment houses and private homes. He thought of his father, who broke tradition and in 1890 invaded with business a territory which had been reserved exclusively for residence. The son recalled the vacant fields which then lay only a short distance to the north. He walked outside to look up at the sign 'H. C. F. Koch & Co.,' for it will not remain much longer on the front of 132-40 West 125th Street. Harlem's oldest department store has passed out of the hands of the founder's family. Koch's, a by-word with uptown shoppers, soon will be no more, he thought, and its passing is but another token of the changed neighborhood. Although he has sold the business to A. Schaap & Sons, clothing jobbers, he could not give up his associations all at once. That would be too much of a wrench, he explained. So the six-story building running through to 124th Street and the warehouse on the opposite side of 124th Street will remain in the name of the Koch family, under lease to the new store. ... His father, H. C. F. Koch, left his home in Prussia at the age of 20 to seek his fortune in the gold fields of Australia. He came on to New York in 1859 and the next year, with his father-in-law, John Heath, opened his first store at the corner of Carmine and Bleecker Streets. The business prospered, and in 1875 the firm moved northward to the Sixth Avenue location. His sons, Erduin von de Horst and William T., took over the management when the father died in 1900. Since December, 1928, when Erduin died, William T. has been in sole control." Two years later William T. Koch died, and this appeared in the New York Times, 21 Feb. 1932, p. 17, "William T. Koch of 224 Lennox [sic] Avenue, son of H. C. F. Koch, who in 1890 erected in the then residential West 125th Street a large department store, died on Friday night in the Harbor Hospital, 667 Madison Avenue. He had undergone an operation three weeks ago and had steadily grown weaker. His age was 58. For thirty-seven years Mr. Koch was connected with the department store of H. C. F. Koch & Co., which was at 132-40 West 125th Street, besides conducting part of the time a real estate business. He retired in August, 1930, when the family disposed of the store. 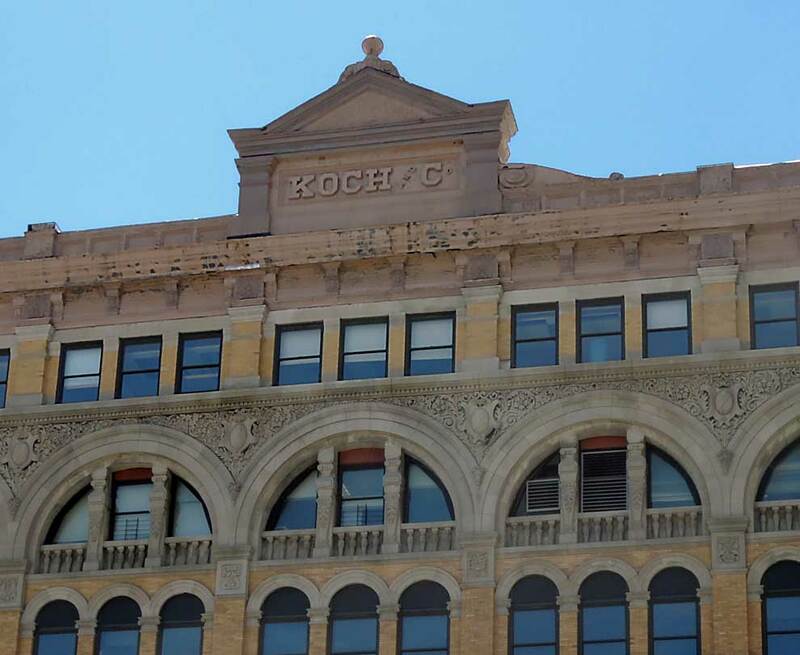 The six-story building, which runs through to 124th Street, and the warehouse on the opposite side of 124th Street remained in the Koch name under lease to the firm that took over the store. Mr. Koch's father left his home in Prussia when he was 20 years old to seek his fortune in the Australian gold fields. Meeting with indifferent success there, he came to this city in 1859. The next year he and his father-in-law, John Heath, opened a store at Carmine and Bleecker Streets. The business prospered, and later was moved to a location on Sixth Avenue, whence it was moved forty-two years ago to Harlem. The senior Mr. Koch died in 1900, when the management was taken over by his elder son, Erduin von der Horst Koch, who died in December, 1928, and William T. From then until the business was sold, two years ago, it was operated under the direction of William T. Mr. Koch was an enthusiastic horseman, being a member of the United Hunts Racing Association. ... He is survived by two nieces. Funeral services will be held at 2 P.M. on Tuesday in St. Andrew's Church, 127th Street and Fifth Avenue." This ad for H. C. F. Koch & Co. appeared in The Cosmopolitan, vol. IX, no. 6, October, 1890, when Koch was located on 6th Ave. at 20th St. This ad for H. C. F. Koch & Co. appeared in The Sun, 2 Dec. 1894, when Koch was located on 125th St. The Metropolitan Museum website show a photograph by Walker Evans of an H. C. F. Koch window display. Another shows shoppers on the sidewalk in front of the store. The date assigned these photographs is 1930-31, which was at the very end of the company's existence. The back end of 132 W. 125th St. on 124th St. has an identical Koch and Co. inscription.